A plastic-free ocean, 100 carbon neutral cities by 2030 and cutting dementia by 50% are highlighted as examples of missions that could drive innovation and economic growth in a report for the EU by a top UCL professor. Professor Mariana Mazzucato, director of UCL’s Institute for Innovation and Public Purpose, spelled out a vision of a mission-oriented approach for the EU’s new research and innovation programme launching in 2020 and expected to be worth between 80bn and 100bn Euros. Her report was requested by Carlos Moedas, Commissioner for Research, Science and Innovation, as the EU looks to develop a successor to the Horizon 2020 research and innovation programme, which ends in two years’ time. Mazzucato has been developing the mission-oriented concept in economics for years including a conference she held in London in 2014 called ‘Mission Oriented Finance for Innovation’, where Vince Cable provided the keynote address. Missions aim to inspire people by solving some of the biggest challenges society faces from climate change to inequality, driving collaboration across different industries and bodies in both private and public sectors. Missions are more concrete than broad challenges in that they have clear time bound targets—where the question ‘did we reach the mission?’ can be answered yes or no. They require what Mazzucato calls a ‘market shaping’ framework rather than the more traditional and passive ‘market fixing’ one that mainstream economists are wed to. “I look at what we can learn from the missions of the past – like NASA’s Apollo Moon programme – and how to apply those lessons to the more complex societal challenges of today,” said Professor Mazzucato, who is due to take up a post as adviser to Commissioner Moedas in April. 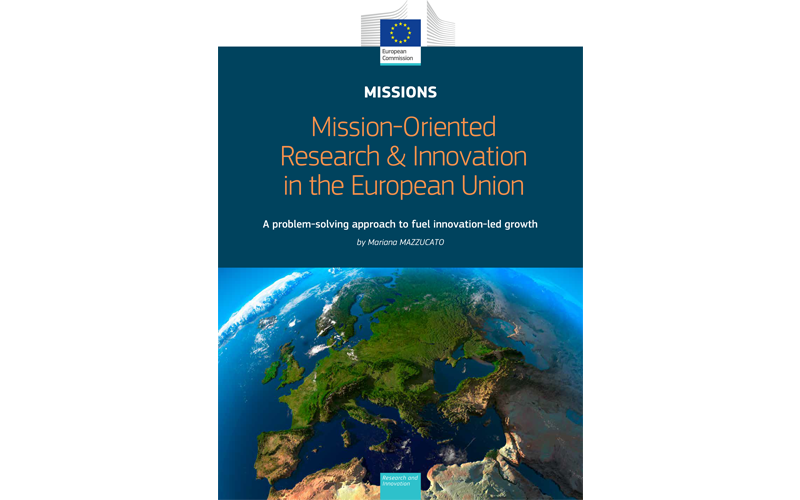 Her report, entitled Mission-Oriented Research and Innovation in the EU, includes three illustrative examples of the types of missions that could be mounted to stimulate research and innovation. The first, a vision for plastic-free oceans, could set a target of reducing the amount of plastic entering the marine environment by 90% and collecting more than half the plastic in the oceans, seas and coastal waters within the next ten years. This would mean every year stopping at least 7.2m tonnes of plastic entering the seas and collecting at least 2m tonnes of plastic. It would draw in experts from chemical engineers, marine biologists, environmental scientists and earth observation specialists to fishermen, tourists and local people. Every year Europeans generate 25m tonnes of plastic waste, of which less than 30% is recycled. Plastic makes up 85% of beach litter. The mission would require a combination of solutions, focusing on different facets of the problem. For example, an autonomous ocean plastics management station could stimulate the development of a hybrid plastics-digestion mechanism possibly using nets. This, tin turn, could kick-start an innovative and more efficient way of removing plastics from the ocean. A second mission, to have 100 cities reaching a net zero greenhouse gas emissions balance by 2030, could stimulate research and innovation in urban planning, construction, energy efficiency, mobility, behaviour and food production. With 18.7m Europeans expected to be suffering dementia by 2050 (currently it is an estimated 10.5m at a cost of 530 Euros per citizen per year), a third mission to halve the progression of the disease in affected patients within ten years would save some 92bn Euros in healthcare over that period. It would draw in patients, doctors, social workers, families, designers to collaborate, alongside inter-disciplinary research. Her report is the latest in a series of inputs the Commission will consider in shaping the next EU research and innovation framework programme (post-Horizon 2020), and maximising its impact. It will now be put out to consultation. Mr Moedas, who often cites Mazzucato’s concept of ‘market shaping’ policies, has endorsed her mission-oriented approach, said: "Mariana Mazzucato provides the Commission with a valuable vision at a crucial point in the drafting of the next EU research and innovation programme. Her report provides clear insight in how research and innovation missions can create impact with societal relevance and how to design and implement such missions. I believe this will be another important step in the evolution of how we invest in research and innovation at the European level." As part of the preparations for the report, Professor Mazzucato held a series of meetings with stakeholders between December 2017 and February 2018. Stakeholders included European think tanks, professional research organisations, representatives of High Level R&I Expert Groups and European Commission Directorate Generals. Professor Mazzucato currently holds the Chair in the Economics of Innovation and Public Value at University College London (UCL). She is founder and director of UCL’s new Institute for Innovation and Public Purpose. Her research covers the relationship between financial markets, innovation, and economic growth. She is author of the best-selling book The Entrepreneurial State: debunking public vs. private sector myths. Her new book, The Value of Everything (Penguin) is due in Spring 2018. She won the 2018 Leontief Prize for Advancing the Frontiers of Economic Thought, and was named by the New Republic as one of the '3 most important thinkers about innovation'. The UCL Institute for Innovation and Public Purpose is hosting a new Commission to solve grand challenges in innovation and industrial strategy with a mission-oriented framework.